As the show progresses, one of the biggest about-faces in anime history occurs. Aizen is apparently murdered by an unknown assailant. Later though, it is revealed that Aize, who is originally portrayed as calm and compassionate, is a mastermind who would use Rukia Kuchiki, his subordinate Momo Hinamori, and anyone else to use the power of the Hōgyoku. Aizen becomes the primary villain of the long-running and ever-popular series (more spoilers ahead). 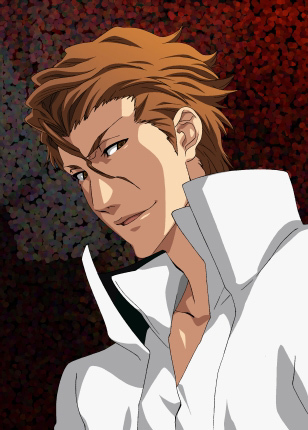 It’s perhaps easy to compare any anime villain to the Prince of Darkness; however, Aizen’s connections are particularly bold and transparent. Without delving into extra-Biblical literature, it’s easy to find similarities between the former shinigami and Satan. Let’s start with the most obvious: they’re both handsome devils. While Satan may have many forms (though horns and pitchfork aren’t likely – they were added by artists hundreds of years after Jesus’ time), one may or may not surprise you. The Bible describes Lucifer as beautiful (28:17&version=ESV">Ezekial 28:17); because of this, he became proud and opposed God. While Aizen’s looks aren’t the center of his pride, there’s no doubt he’s a handsome figure, in almost all shapes and forms. He starts out with the nerdy-but-handsome look; then he turns into the slicked-back, bad-guy handsome look; then he turns into a all-white, sleek, scary handsome look when the Hōgyoku transforms him. Oh, and he, too, opposed his head – in this case, the Spirit King of Soul Society. Both were once on the side of “good,” before each became the epitome of evil. Aizen is, if nothing, a sly man. Always a step ahead, Aizen hatches his plans without hesitation or fear. Even his Zanpakuto, Kyōka Suigetsu, is mystifying, placing an individual into a form of hypnosis. Satan is also a sly creature, which is why Christians consider him dangerous. One doesn’t have to look any further than his temptation of Christ, in which he attacked the soon-to-be Messiah at his physically weakest by offering bread to the fasting Jesus, trying to goad Him into showing faith, and tempting Him by offering a way to power and rule without having to undergoes the trial that awaited. Smooth operators, both. Each are described as rulers of a place apart from the afterlife. John calls Satan the “prince of this world” (John 12:31) and he’s referred to as the ruler of earth a number of times. Aizen becomes the ruler of Hueco Mundo after leaving Soul Society (and even begins to make his presence known on earth). While in their kingdoms, each has powerful minions – the Bible describes Satan’s demons, of which he has at least hundreds (though likely many more). Aizen, of course, has Coyote Starrk, Baraggan Luisenbarn, Tia Harribel and all the other Espada. But even with their powerful associates, Satan and Aizen, like all evil, must fall. In Revelation, John prophecies that Satan will lead a final war against Jesus before being tossed into Hell for eternity. He will be under “lock and key.” Aizen meets his match in a Messiah-figure as well, ultimately losing to Ichigo. He, too, comes under lock and key, being tosses into Muken for 20,000 years which, hey, might as well be an eternity. With Aizen’s arc finally ending in both the Bleach anime and manga, we can look forward to a new enemy. But for Christians, the battle against Satan is still happening, continuing on a daily basis. Luckily, our Ichigo is described as always being with us. I find it interesting that in equating Aizen and the Devil you missed an interesting and elemental detail that seems to me would strike a more resonant chord with human readers (if a believing non-Christian can be permitted to overstep a bit). Aizen’s quest is to BECOME god, not merely because of his pride, but also because he DOESN’T BELIEVE THERE IS ONE. When he discusses the Spirit Key and the Spirit King at the end of the Soul Society Arc, he implies that no one is minding the store and sets off on a quest to upend the natural order in order to fill the place of the higher power. I don’t remember specifically where, but Urahara seems to imply to him during one of their other meetings that Aizen’s take on the cosmos is simply wrong and that the fact that there doesn’t appear to be a Spirit King doesn’t mean that there isn’t one. This seems to me–again, as someone with less direct personal experience–as a parable about faith. Aizen’s lack of it causes him to upset the natural order and attempt to commit mass murder in order to give birth to a god (himself) and impose some kind of order on the universe. Thanks for the additional information. I…just don’t remember a lot of that, hehe. It was a long arc, and I’m not the biggest Bleach fan (I enjoy the show and manga, but I’ve kept up with it inconsistently), so it’s very helpful that you provided this info. I think that, actually, what you wrote would make great material for an entirely different post. If Aizen doesn’t believe there is a god, that would be a little different from Satan, as present in the Bible; there, he certainly believes in a God, but just doesn’t follow Him. The main problem around the Aizen story is how the writer managed to work it out. I didn’t like how he waited for Ichigo the whole time. Aizen was always a smooth operator, but in the end, he just became another emo-maniac. There was a chance to really do something special in his showdown with Ichigo, and I think the opportunity was missed. Otherwise, the most recent arc was enjoyable, I thought. Showdown with Ichigo? Maybe I need to get caught up on Bleach. It sounds like it gets pretty good (I’m somewhere in the part where Ichigo goes to Hueco Mundo). I must admit – I really like the character of Aizen. He’s so “sneakily” bad. I really think he fits the Biblical image of Satan so well. Woh…you’ve got a LONG way to go…LONG way…LOOOONG way. I really like the characters in these arcs, but it just gets kinda old. The Hueco Mundo arc, in my opinion, got pretty boring. Yep. Definitely gets kinda old. And there are a few characters that really annoy me (though there are also a few I think are really cool). The only reason I even got this far was because a friend loves it. If I knew I was going to see her again soon, I’d probably put Bleach on higher priority. you know of all the christian reviewing site this is the best. I’ve watched allot of anime and only recently am I pulling away from these demonic anime. I must say I approve of your accurate rating, being a big anime viewer myself. Some of these anime like pokemon, which are popular, are not good for our youth and it can be hard to give up your favorite anime after you find out its not good for your spirit man. We really don’t do too many reviews on this site, but thank you for the kind words, nonetheless.